The wedding represents the day when a couple commits to a life together and it is a great event for receiving gifts. Now, there are plenty of wedding gifts to choose from but just put that margarita maker aside and think about something a bit more personal. Gifts that show how much you thought about it and that you wanted to mark this event with something personal that both of them will appreciate and hold on to forever. Some gifts might be playful or looking towards the future while some gifts might be about bringing back good old memories. Something that they can use in their new house is always a good idea. Here we have paintings that can be of a place they both enjoy; you can also think about taking a picture of them and make it a painting at a specialized store. Who doesn’t want to have a classic painting of themselves on the wall? There are also other prints which can look good on the wall and at the same time show the importance of their commitment. For example, a heart in the sand print with beautiful frame would look great on the bedroom wall. Another great thing that would look great on the wall is a travel destination map so that they can choose where to spend their next holiday together. Ornaments with “Just married” can be a nice touch along other gifts. For example, you can get a small car bumper with little cans on a string; you can also include their names on it. Wedding gifts are all about sets of two. 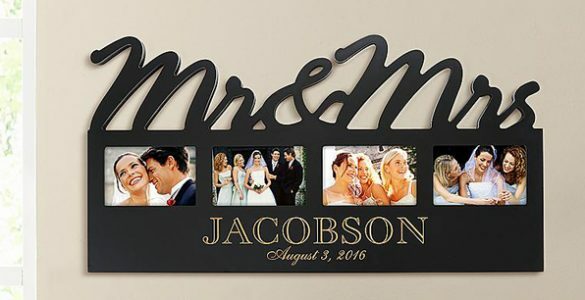 You can even personalize champagne glasses to have their names on them for the big toast; it will be a nice touch to complete their perfect night. Other sets of two can be personalized pillows that can have a cute text on them about the fact that they can never be apart. The classic matching bathrobes that have their names on them is never a bad idea and they will surely appreciate the gesture; just make sure that you get the most comfortable ones you can find.